As you know, I loved the film Arrival. As is my habit after watching a great movie based on a book, I immediately acquired the source material. It turns out that Stories Of Your Life and Others is actually a short story collection and “Story Of Your Life” is specifically the installment that served as Arrival’s source. 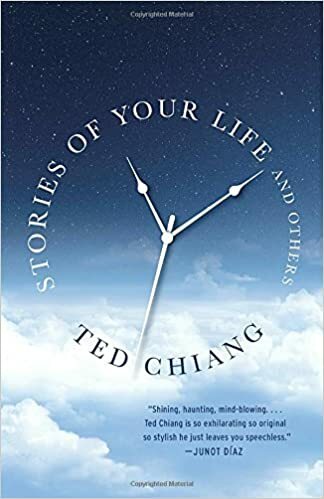 However, there are seven other shorts in this collection by Ted Chiang, and they are all imaginative and thought-provoking. Chiang trained as a computer scientist, and it shows in his writing. He is very precise, very analytical, and very scientific. Yet he also has a great sense of character, pacing, and detail. I especially appreciate that he seems to know the appropriate time to really delve deeply into scientific jargon, but he also knows the right time to pull back and simply let the story flow. I would not say that all of his stories are purely science fiction, by the way. “Tower Of Babylon,” for example, explains the science behind building a structure reaching to the heavens, but I would say it is more commentary about the human spirit than anything. “Hell Is the Absence Of God,” a story about the physical, spiritual, and emotional consequences following sporadic visits by actual angels, is also far more about what it means to be human than anything else. In fact, at their root, most of Chiang’s stories in this collection are investigating the plight of the human condition. He tackles love, greed, beauty, sin, justice, obsession, honesty, and even eternal life, but he does so in extremely smart, original, and imaginative ways hidden within the genres of science fiction, steampunk, and fantasy. If you enjoy innovative, thought-provoking stories, I highly recommend this collection. They are all fairly complex reads, but well worth the effort. You will like some more than others, but each is to be appreciated in its own way.